When Lenin and the Bolsheviks took over Russia in 1918, they faced enormous odds against the German Empire, and then again against multiple enemies in a bitter civil war. 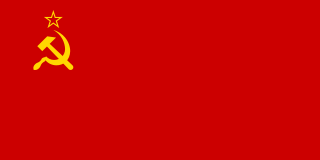 (It was reorganized as the Soviet Union (USSR) in 1922). At first, it was treated as an unrecognized Pariah state because of its repudiating the tsarist debts and threats to destroy capitalism at home and around the world. 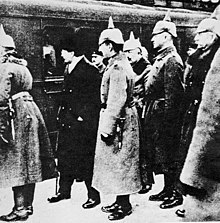 By 1922, Moscow had repudiated the goal of world revolution, and sought diplomatic recognition and friendly trade relations with the world, starting with Britain and Germany. Trade and technical help from Germany and the United States arrived in the late 1920s. Under dictator Joseph Stalin, the country was transformed in the 1930s into an industrial and military power. A totally unexpected treaty with Germany in 1939 allowed the Nazis to launch World War II with attacks first on Poland and in 1940 Western Europe without worrying about a two-front war. Germany in 1941 turned east in a massive invasion that reached the outskirts of Leningrad and Moscow. However, the Soviet Union proved strong enough to defeat Nazi Germany, with help from its key allies the In 1945 the USSR became one of the five permanent members of the UN Security Council--along with the United States, Britain, France, and China--giving it the right to veto any of the Security Council's resolutions (see Soviet Union and the United Nations). 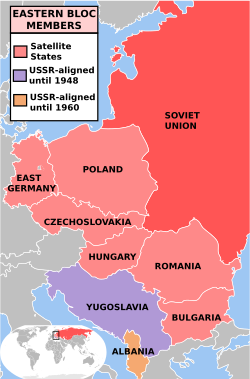 By 1947, American and British anger at Soviet control over Eastern Europe led to a Cold War, with Western Europe organized economically with large sums of Marshall Plan money from Washington. 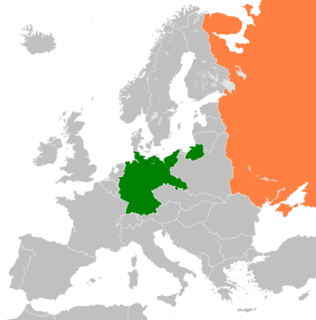 Opposition to the danger of Soviet expansion form the basis to the NATO military alliance in 1949. there was no hot war, but the Cold War was fought diplomatically and politically across the world by the Soviet and NATO blocks. The history of the Soviet Union between 1927 and 1953 covers the period in Soviet history from the establishment of Stalinism through victory in the Second World War and down to the death of Joseph Stalin in 1953. 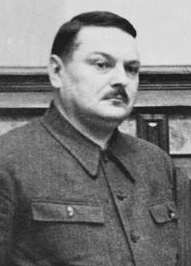 He sought to destroy his enemies while transforming Soviet society with aggressive economic planning, in particular a sweeping collectivization of agriculture and rapid development of heavy industry. Stalin consolidated his power within the party and the state and fostered an extensive cult of personality. Soviet secret-police and the mass-mobilization Communist Party served as Stalin's major tools in molding Soviet society. Stalin's brutal methods in achieving his goals, which included party purges, political repression of the general population, and forced collectivization, led to millions of deaths: in Gulag labor camps and during man-made famine. 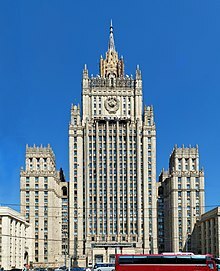 Iraq–Russia relations is the bilateral relationship between Iraq and Russia and, prior to Russia's independence, between Iraq and the Soviet Union. The current Ambassador to Russia is Haidar Hadi who has been serving in Russia since December 2016. Soviet Union–Turkey relations were the diplomatic relations between the Soviet Union and the Republic of Turkey. Soviet Union-Africa relations covers the diplomatic, political, military and cultural relationships between the Soviet Union and Africa, from the 1940s to 1991. Joseph Stalin made Africa a very low priority, and discouraged relationships or studies of the continent. 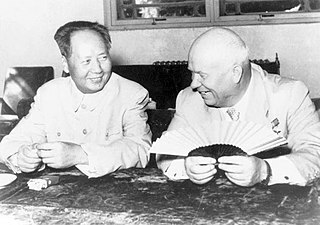 However the decolonization process of the 1950s and early 1960s opened new opportunities, which Soviet leader Nikita Khrushchev was eager to exploit. The Kremlin developed four major long-term policy goals: 1) To gain a lasting presence on the continent. 2) To gain a voice in African affairs. 3) To undermine Western/NATO influence, especially by identifying capitalism with Western imperialism. 4) After 1962, it fought hard to prevent communist China from developing its own countervailing presence. At no time was Moscow willing to engage in combat in Africa, although its ally Cuba did so. Indeed the Kremlin at first assumed that the Russian model of socialized development would prove attractive to Africans eager to modernize. 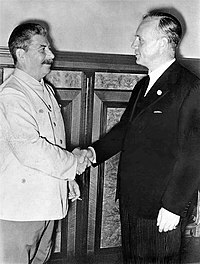 That did not happen, and instead the Soviets emphasized identifying likely analyze and giving them financial aid and munitions, as well as credits to purchase from the Soviet bloc. Although some countries, such as Angola and Ethiopia, became allies for a while, the connections proved temporary. 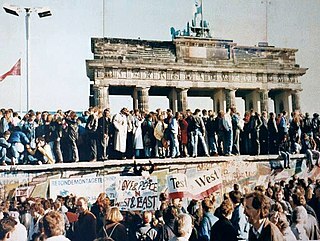 With the collapse of the Soviet Union in 1991, Russian influence greatly diminished.